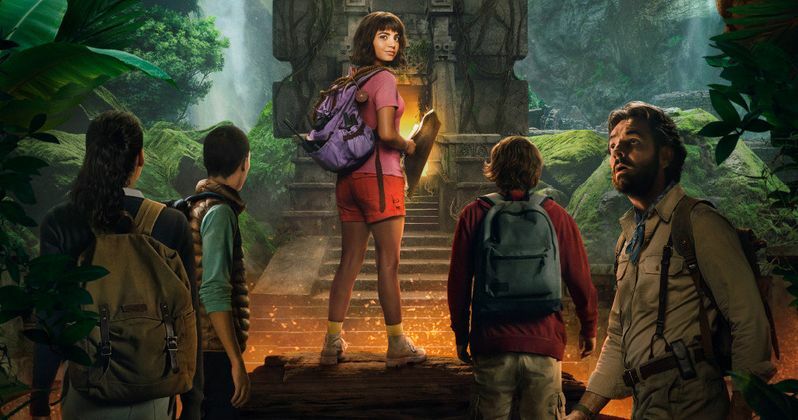 The first footage from Dora and the Lost City of Gold is just around the corner. To celebrate and raise awareness, Paramount has released two posters for the upcoming live-action movie, one of which features the debut of Boots. It's been pretty quiet on the Dora the Explorer news front after it was revealed that Benicio Del Toro was cast as voice Swiper, the thieving fox late last year. Del Toro came on board after production had already wrapped in Australia. The first trailer for the Dora the Explorer movie will premiere during the Nickelodeon Kid's Choice Awards this Saturday. No specific time has been revealed, but the show starts at 8 PM Eastern. Since the live-action movie doesn't hit theaters until the beginning of August, it is believed that fans will be treated to a short teaser instead of a full-length trailer, though that could change. One would assume that we'll be fully introduced to Isabel Moner's Dora and possibly even Boots the Monkey, since he is shown off in the latest posters for the project. The first Dora the Explorer movie poster features Isabel Moner as Dora gazing upon the Lost City of Gold with Boots the Monkey perched on her iconic backpack. "Explorer is her Middle Name," is written across the top of the poster. While the first poster is pretty good, it's the second that gives us another look at Moner's face and Boots, as he swings on a vine. Other members of the cast are also spotted, but you can only really see the backs of their heads as Dora leads the team into the Lost City of Gold. The Dora the Explorer movie has the titular character on her way to start high school, which is a pretty big adventure for her and her best friend, Boots the Monkey. However, another adventure lurks in the shadows as Dora learns that she has to rescue her parents (Eva Longoria, Michael Pena) and figure out the Lost City of Gold's secrets. Isabel Moner's Dora leads Boots, Diego (Jeffrey Wahlberg), a mysterious jungle inhabitant (Eugenio Derbez), and a group of other teens in this big screen expedition. The Dora the Explorer movie hits theaters on August 2nd. The original show on Nickelodeon was a huge hit when it originally aired from 2000 to 2015 and the live-action movie, with CGI elements, is highly anticipated by fans of all ages. Thankfully, we'll get to see what the tone of the movie is when the first teaser is released this weekend, but it is assumed that it will be an awesome time for families when it finally hits theaters. While we wait for this weekend to deliver the first footage, you can check out the two Dora posters below, thanks to the Dora and the Lost City of Gold Twitter account.